This is a picture of him at the age of 80. 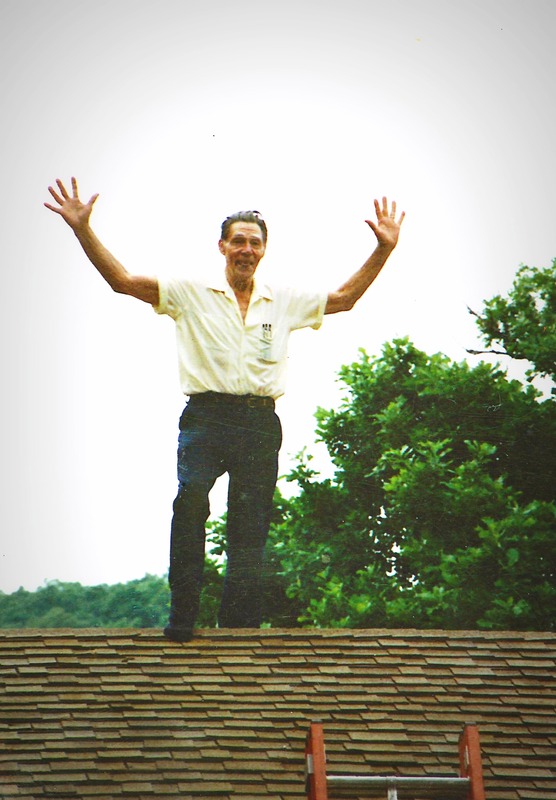 Just up on top of his 2-story home near the Lake of the Ozarks, checking something on the roof and acting goofy about it. But that was just hamming for the camera. He was anything but goofy for real. Handsome, very affectionate and loving, constantly speaking sweet words and kind wishes and showing us how a man should love a woman (I’ve written about him and my grandma HERE, with a short video about their “Epic Love”). He was strong, he was authoritative, and I saw even my dad “behave” around his father-in-law. He was always dressed (with a few buttons left undone) and shirt tucked in, he always had a great tan from being outdoors all the time and his hair remained jet black almost until he died at 88 or 89. He was a handsome, wonderful man and incredible dad to my mamala. And the only person in the whole wide world who called me Debbie-Jean. I think of him often and still hold him as one of the greatest fathers (and grandfathers) of all time.